Anyone remember cruising on the Southward. We sailed her on our very first cruise (March 88) and have many fond memories. Anyone want to share any Southward stories we would love to hear them. 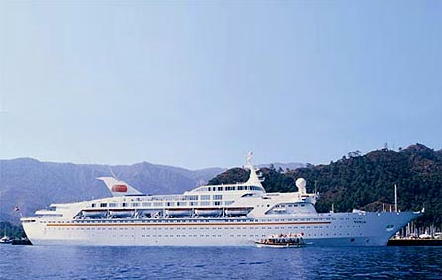 Southward entered service in 1971, and operated with NCL, including service from California, until sold to Airtours in 1994, becoming the Seawing of Sun Cruises. From 2004 she joined the Louis Cruise Lines fleet, under the name of Perla. 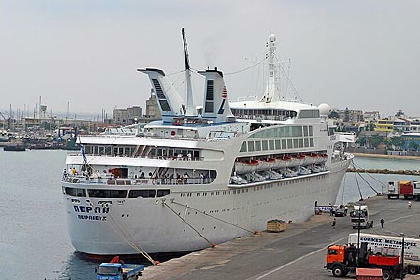 In 2005 she operated cruises out of Piraeus to the Greek Islands and Turkey, after a winter in the Far East. You can still book a cruise on her if you like her so much. ps, I've heard rumors that Louis Cruise Lines is interested and looking at buying the Norwegian Majesty. Rumors are rumors, but interesting never-the-less. We sailed on the Southward in 1979 to the western Caribbean out of Miami. It was our first NCL cruise and I loved that ship. Tiny, but it had everything we wanted in a cruise. The casino was only a few slot machines. It was my first exposure to the DiveIn program and it turned me into a life long snorkeler. We've been on dozens of cruises and we rate our Southward cruise as one of our favorites. I enjoyed reading these posts about the Southward. I did a stint working as a pesty photographer on the ship out of San Pedro, Ca. I believe it was 89-91... I would have to verify. I was the ONLY photographer on the ship that was American, as I worked for a company operating a cancession out of the UK. If you sailed during this time, there's a good chance you have a photo that I had taken. There were only 3 photogs, and the lead photog rarely photographed. Hint - Do you ever remember a white mexican in a Sombrero grab you by the neck as you got off the ship in Ensenada... ME! I performed with the Jimmy Dorsey Orchestra as a guest band on a 4 day cruise from San Pedro. Was sometime in the mid-late eighties. At that time I lived and worked in San Pedro and drove by the cruise terminal everyday going to work. The Southward and that similar Princess Cruise (love boat) were really the only ships always there....before the giant Crystal Star made her appearance. ...but I just got back from a Mexico cruise on the Oosterdam...what a difference! It's a shame to read some of the reviews on this ship now that it is the Perla in the Mediterrean....sounds like it's really falling apart! I still have the metallic picture of the ship I won playing pictionary in the main theater! It was my first too. I had a great time, invited to join the Captain and his good lady for dinner on the formal night. Greek chap, as I recall, and his partner was very attractive. Crashing bore of a college proffessor at table directly opposite me that night though. It was all I could do to not kick his shins under the table. Hope it wasn't any of the previous posters! We sailed her sister the Starward in 1991. She was a wonderful ship and we really enjoyed the size of her. Here is are some pictures of the Perla (ex Southward). The Starward wasn't a true sister of the Southward. Starward was a sister of the Skyward. Southward was one of a kind. Oops, never mind. Turns out the the SS Azure Seas was my first, MS Southward was a very close second. Not one of a kind, exactly. Her sister was supposed to be called SEAWARD (not to be confused with the much later, larger one) but wound up being completed as P&O's SPIRIT OF LONDON instead, then becoming SUN PRINCESS, STARSHIP MAJESTIC, SOUTHERN CROSS, FLAMENCO and finally NEW FLAMENCO which is her current name for the Spanish tour operator Travelplan. The only real difference between this ship and SOUTHWARD is that P&O had her completed with a large single funnel rather than NCL's then-trademark twin funnels. That makes sense. No Greeks on NCL :) . Host Doug, I guess it depends on how you qualify a catagory, but I always thought Home Line's Oceanic as the first ship exclusively designed and built for cruising. At least that's how Home Lines use to advertise her. She technically didn't cruise in the Caribbean though, sailing to the Bahamas and Bermuda instead. Was on a 3-day to Ensenda around 1991 - I really like the new NCL ships though! Didn't realize how large a ship could really be until the newer ones came out! Do you think I might be able to get C&A Cruise Points for the Azure Seas? Host Doug, I guess it depends on how you qualify a catagory, but I always thought Home Line's Oceanic as the first ship exclusively designed and built for cruising. At least that's how Home Lines use to advertise her. They did - but they lied, in several ways. First, she was actually designed for Transatlantic service from Cuxhaven to Montreal in the summer. Second, there were actually other purpose-built cruise ships much earlier, e.g. Bergen Line's STELLA POLARIS (1927)... So she could not have been the first anyway. On the other hand, I know of no ship built specifically for Caribbean cruising before SKYWARD. Southward 1993 was my first cruise. My most recent cruise was on the Diamond Princess March 17, 2007. Wow, what a difference in size! Thanks for the pics. Honeymoon - 1981 Southward. Still married to the same lady. That was our first cruise also. Don't remember much except the party hats, etc. on formal night. It was a wonderful experience that got us hooked on cruising. Great Pictures! I really enjoyed the SS France Photo as I cruised her twice as the Norway. Sailed on the Southward on honeymoon in November 1983 and again in January 1985. Sandy Mc Nichol was the cruise director. He and his staff were awesome! My wife and I are going on our 16th cruise Feb 28th on Adventure of the Seas. The difference is the Dawn and the Jewel are not real ships they are Floatels as is all the crap they are building now. They don't build real ships anymore just Orlando Florida resorts with hulls under them. Southward was my first cruise ever...back in the early 70's somewhere. What I recall was being so excited and not knowing what to expect. Hubby (then) and I joined friends for this rolicking good time. I think it was a 4 nighter..can really remember. The only port I can remember is Grand Cayman, where a huge tender called "Bahama Mama" ran ferry service to/from the ship to Gallion Beach on the 7-mile strip. S'ward dropped anchor off-shore at that area. 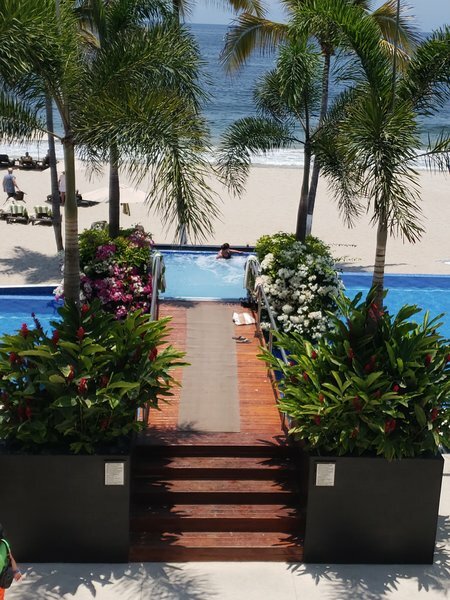 What a wonder the first glimpse of that beach was!! Ate turtle-burgers at a grass hut. I also remember most of the crew were from the Caribbean. The last night they served Baked Alaska....flaming....which was carried into the dining room on the heads of the waiters, who danced to the calypso music blaring over the speakers. I was open-mouthed from the first time I laid eyes on her...and have remained that way the past 35 years or so.....a true addict...and Southward was what got me addicted. This was my first cruise in June 1980. Was with my sister who was an experienced cruiser and many of the staff including bar tenders new her. That meant free drinks until we left port. Back then they did things like that! We were seated with 4 people from Bulgaria that spoke no english so that made the trip so memorable. 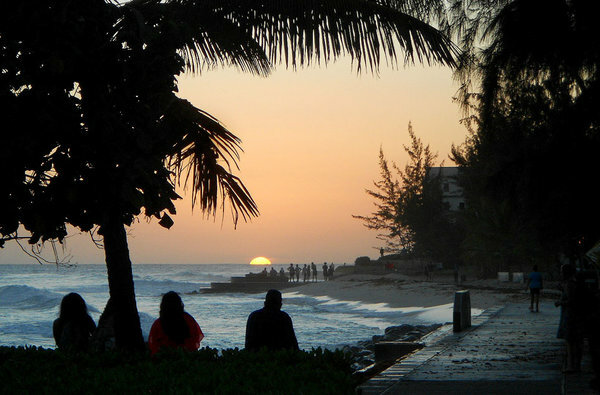 At that time, 7 mile beach was just a beach in cayman, no hotels! Cozamel was a couple of straw huts. Jamaica and climbing the falls was a highlight I will never forget. Lastly, for some reason I remember the house band name "The Vladamir Rubek Orchestra"! They could really rip out a great rendition of Chariots of Fire! All in all, we met great freinds that we are still in touch with today and have cruised several times with them.